1. Yes! That is totally a normal breakfast. Although usually the rice is garlic fried rice. Fried Spam is delicious! My mom makes this like…at least once a month. 2. Tapsilog! I don’t know that I would call it my actual favorite breakfast, but I’ve only ever had it at Filipino fast food restaurants and it’s pretty good. I’m diggin’ the garlic fried rice. 3. Ah, this sweet bread is called ensaymada. It’s crazy because it is sweet bread made sweeter with sugar and topped with cheese. What’s crazier is that this picture is taken from Gemmae Bake Shop, which I always pass by when I visit my family in Long Beach because they live down the street from it. 4. Who makes rice on the stove?! 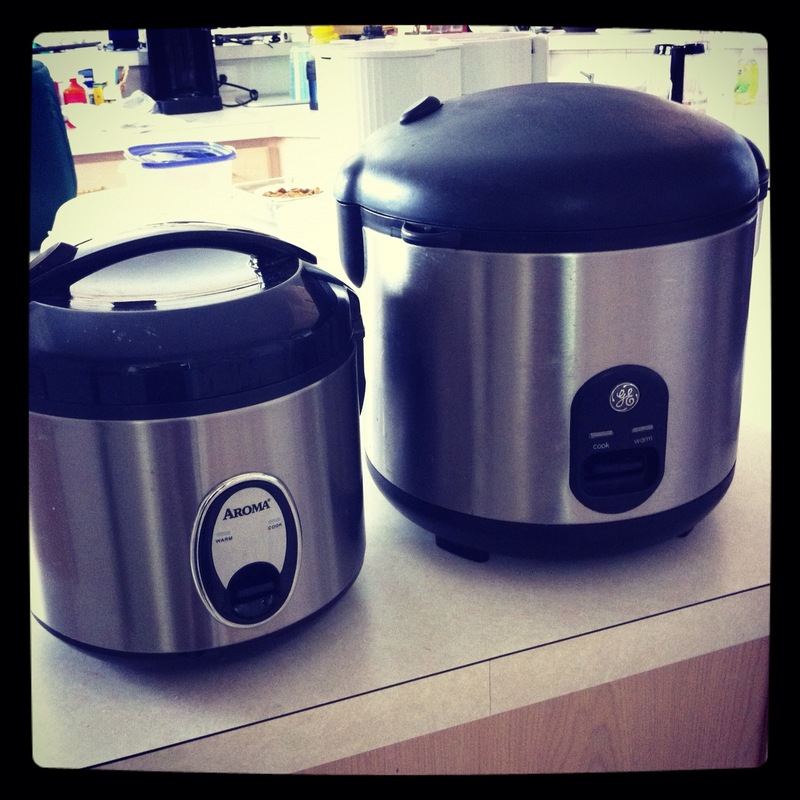 The only way to make rice is to use a rice cooker! But mine aren’t flowery–they are metal. The more adorable one on the left is what I used my senior years of college! 5. Banana ketchup is a must whenever I eat Filipino-style torta (basically, it’s type of omelette) and lumpia. It’s sweet! And yes, the spicy kind does have a nice kick to it. 6. 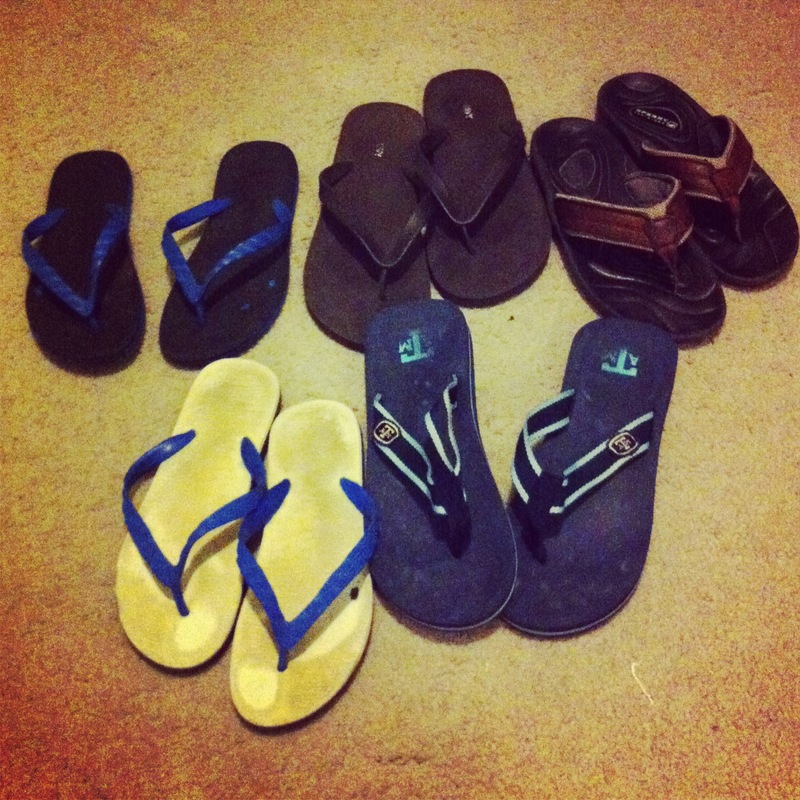 Maybe I don’t have a hundred…but I do have a collection of tsinelas. 7. “Anak” means child, and yes…my mom still calls me that. Though, I’m lucky and have retained my actual name. I think it helps having another sibling because “anak” can be ambiguous when mom is yelling from downstairs that dinner is ready. 10. Tita = aunt, tito = uncle. Yes, because my dad is 1 of 8 and my mom is 1 of 5. That’s a lot of titas and titos. Also, it is totally legit to call my parents’ close friends as titas and titos as well. What an awkward revelation finding out that I’m not, in fact, related to some people I’ve known for a very long time. But perhaps that’s the beautiful aspect of Filipino tight-knittedness. 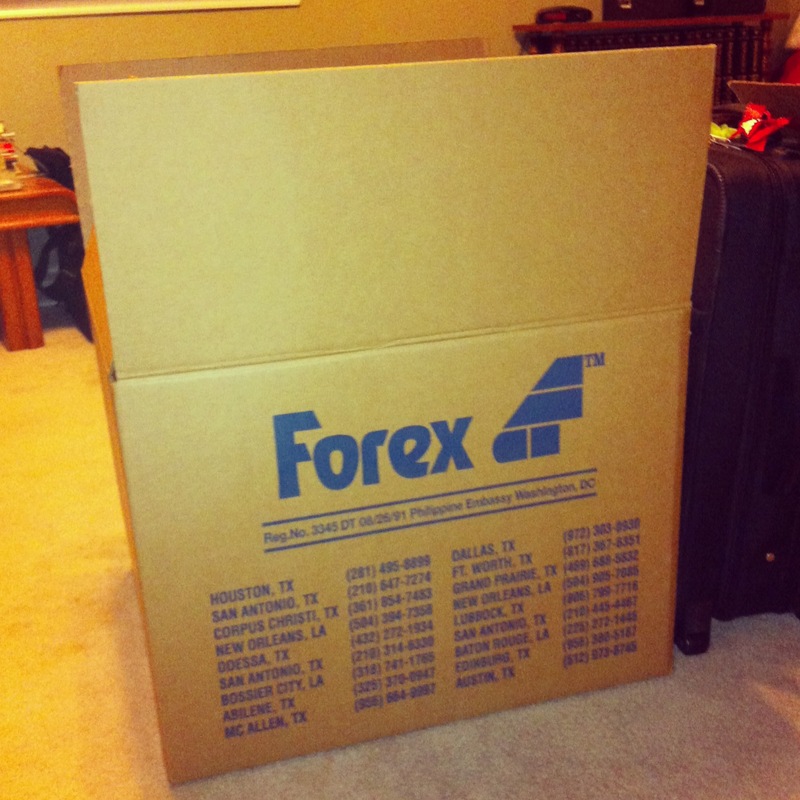 Nanay (aka lola) is going to Canada and the Philippines this summer! 12. Yes, I do. Patented Filipino attention-getters. 14. I’m actually sad that my Thanksgiving doesn’t look more Filipino. My mom usually sticks to the regular Thanksgiving spread, but! …she usually does some sort of Filipino dessert. 🙂 Also, that picture…I wouldn’t call that Thanksgiving but rather … a normal Filipino party. Like, just a normal gathering at someone’s house will have that kind of spread. Not even joking. 15. Actually, I just had pan de sal yesterday morning for breakfast…with peanut butter! Pan de sal is the most versatile dinner roll on the planet. It’s good for breakfast, lunch, and dinner…and can be filled with anything from cheese to fried Spam! But not all pan de sal is created equal. So that’s why we import ours from Long Beach, CA at Betsy’s Cake Center. 16. One time, we took a family trip to Las Vegas just to shop at a Seafood City supermarket. But whenever that’s inconvenient, usually the Asian grocery stores in the area suffices. Where else can you get banana ketchup?! 17. Ah Goldilocks! It’s a combination restaurant and bakery…and it’s a chain. Some of them have invaded the U.S. Pretty good, but…I still think Betsy’s (see 15) has better pan de sal. 18. Halo-halo is soooo good on a hot summer day. It usually has various fruit jellies, fruits, mung beans, shaved ice, coconut, cream or condensed milk, and sometimes found with ice cream on top. Basically, like its name suggests (translated), it is a mix of various sweet foods in a cold tasty treat. Yes, Goldilocks sells ’em! 19. Well, considering all my relatives don’t live in Texas now…we usually have Pacquaio fight watching parties at my non-relative titas’ and titos’ houses. 20. 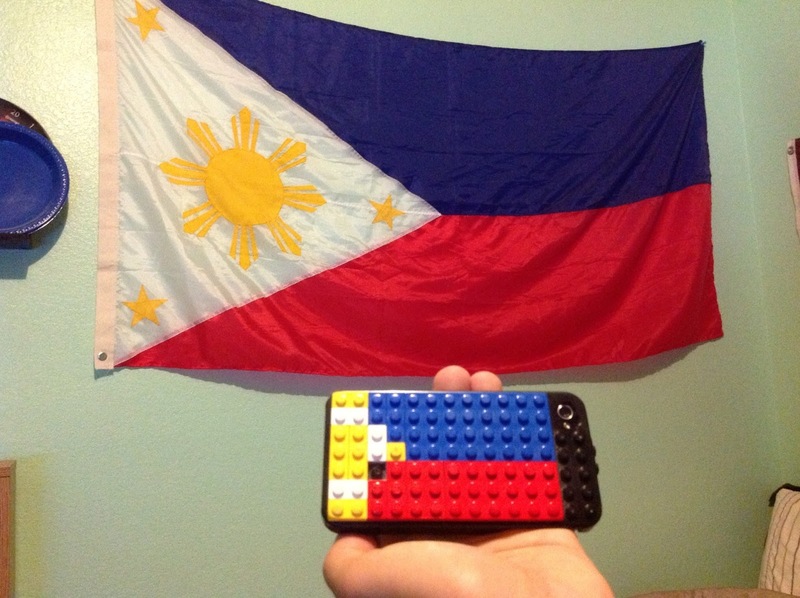 Hmm, if I had a Filipino flag meant for hanging in a car…I totally would. But nah…Rosaries hang from all of my family’s rearview mirrors. 21. Maybe I’m too Texan, but I only call it “air-con” when I’m actually in the Philippines. Or perhaps when referring to my car’s A/C. 23. I was such a band nerd clarinetist in high school and somewhat in college. My bro on the other hand is versed in piano, saxophone, flute, and clarinet. 24. Hmm, but I don’t want to give away our secrets. Actually, that’s probably why we have a large collection of packet condiments so we don’t need to spend as much on the actual bottles of whatever? Or maybe that’s why my dad is quite the handyman so he doesn’t need to hire professional help? 25. You had me at “adobo” -swoon-. Pork or chicken marinated in vinegar and soy sauce…with white steamed rice… sooooo goooooood. 26. Actually, my mom didn’t know what to cook for breakfast when I saw that she busted out the cans of corned beef. Unsurprisingly, this is usually accompanied by garlic fried rice or pan de sal. 28. I think I am too Americanized to fully embrace my Filipino “kamayan” skills. “Kamayan” refers to eating with your hands. Hmm…I usually see my parents go kamayan style when eating crustacean seafoods. 29. Oh. My. Gosh. It is a very dangerous thing whenever my (actual) titas get together. So much laughter and talking loudly. It’s also a dangerous thing whenever my mom gets together with my (non-relative) titas. So much randomly breaking out into line dancing and laughter and talking loudly. Totes cray. 30. Actually…I wouldn’t limit to just family gatherings that end up with karaoke. Pretty much any Filipino party/gathering that involves food and drinking…will probably end up in karaoke. I must stress that we created the original Magic Mic. And I’m not talking about a male stripper. 34. Watching this video is like watching my Filipino life. Truth.